When it comes to home projects, regardless of what type of work is being done, one thing that must be considered is water. It’s everywhere! In the ground, in the sky, in our pipes, in HUMANS! And while H2O is our lifeline in so many ways, as homeowners, it tends to be the bane of our existence. This is especially the case when it comes to room renovations or finishings like one that might take place in a basement or garage space. 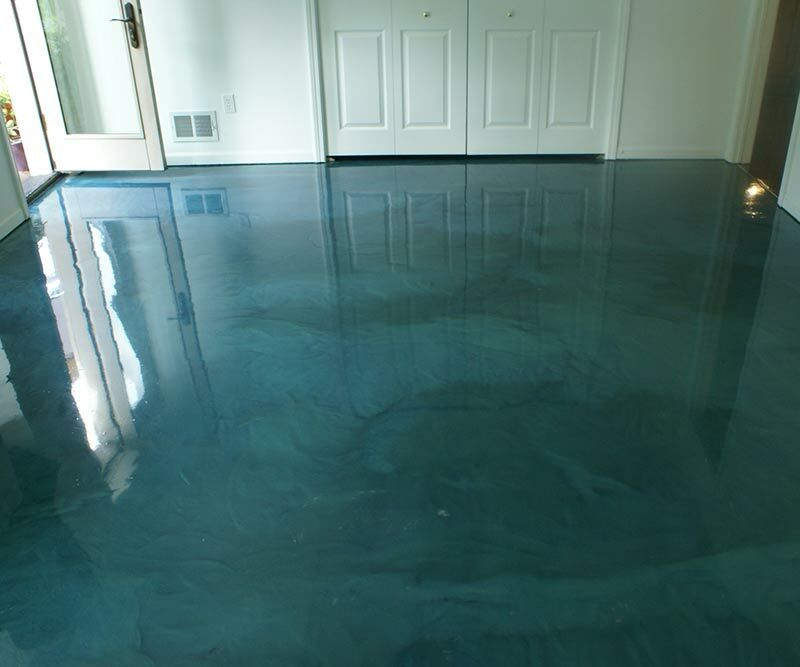 Whether you tend to get water in these areas or not, every room starts the ground up, with flooring. While you may not think your new finished basement will have water problems, it may also be the case that these moisture issues simply haven’t revealed themselves yet. I mean, really. How often are you down in the cellar for anyways? Five minutes at a time? Just long enough to switch the laundry or check the oil gauge? With a finished room in the basement or garage you are likely to spend much more time utilizing a bonus room in space that before seemed wasted or poised simply to collect clutter. With the nature of these future offices, laundry rooms, or living areas as they are, you will want to do your part in protecting your furniture, decor, and your family from water and all that comes with it like mold and rot. In this article, we outline the best flooring options for high moisture areas. Take these into consideration, as well as your budget, before your renovation begins in order to keep water where it belongs, outside your home, soaking into grass and garden beds. 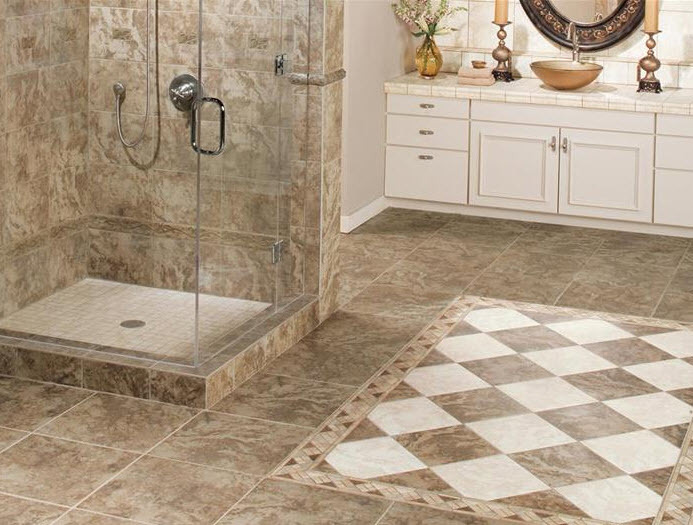 Tile is a classic home flooring material that is both durable and versatile in that there are many elegant decorative tile designs. Your material choices include everything from natural stone to ceramic, but some are better suited for water prevention than others. 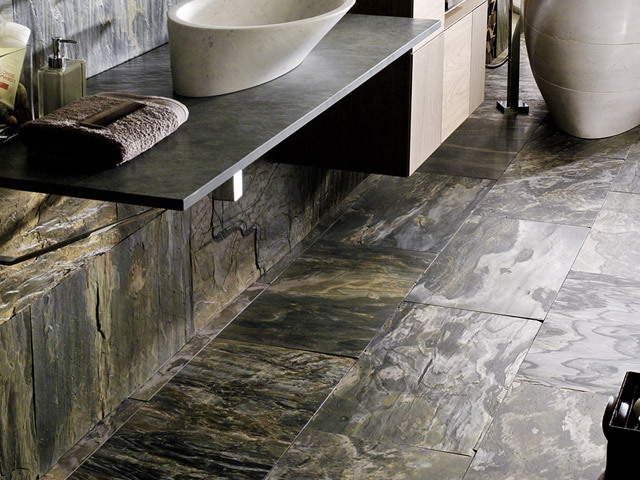 If using tile, you will be creating lots of seans (aka many routes water can take toward the surface of your floor). That said, you’ll need to seal grout lines and use a high-end, water resistant grout to ensure your dry footing. Ceramic Tiles: These are waterproof, heavy duty, and comes in pretty much any color, size and style you can think of. The beauty of ceramic tiles is they are easily cleaned. With textured ceramic, the cleaning is slightly more difficult, as the surfaces tend to be more porous. That said, these are the best at keeping water from penetrating the flooring surface. Stone: Natural stone tiles like marble, travertine, limestone, slate, granite, sandstone, are super durable and absolutely gorgeous. All of these stones are to be sealed for extra watertight flooring, though some are more absorbent than others. The absorbency of each stone is rated according to the following labels: semi-vitreous, non-vitreous, impervious, vitreous. Non-vitreous stone is the most absorbent and thus not the best choice for high moisture areas. It is also important to note that natural stone can tend to be super pricey, so if you are working on a budget, which is likely the case as this reno will likely be for the purpose of bonus space, than stone is not the best choice. 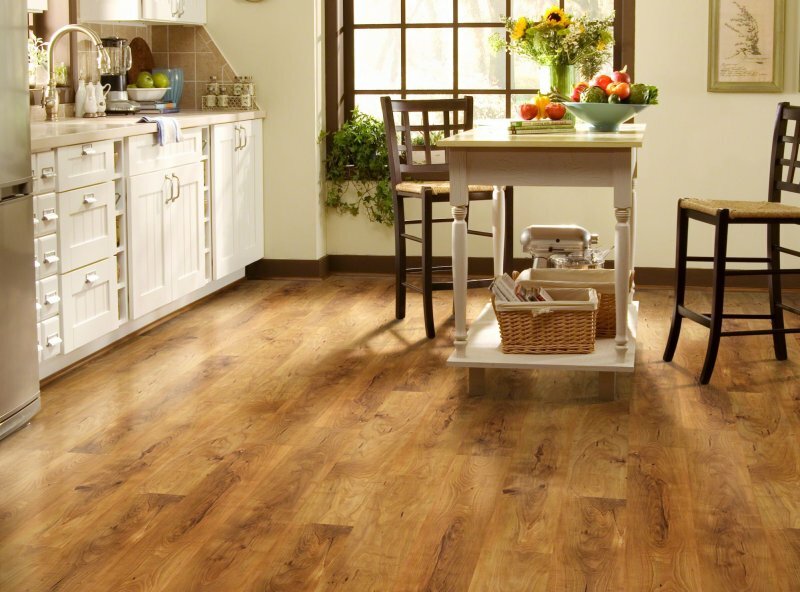 Vinyl flooring is easy to care for, affordable, and super water resistant. You can purchase vinyl flooring in many styles, colors, and designs often manufactured to mimic a tile or natural stone look. Different styles mean different application processes. Simply put, some vinyl flooring options are laid in full sheets as opposed to individual tile-like sections. The less seams you have the less opportunity moisture has to get through. Thus, full sheet vinyl is best for high moisture areas. Vinyl flooring is often conflated with cheap-looking linoleum, but this is no longer the case in the modern age of construction. There are higher-end options that are nearly indistinguishable from hardwood flooring. The beauty of these is the sub-floors that are meant to be installed underneath, which are often meant to add an additional layer of moisture resistance. If a true bonus space is what you are after then maybe the existing concrete floor in the basement or garage space you intend to finish is okay! To shake up the look a bit and give the space a bit of elegance, there are concrete stains, seals, paints, and even stamps that provide a design element to the solid floor. In all of these scenarios, to ward off water you’ll need to apply a clear coat sealant. Laminate is much like high-end vinyl in that it is a layered flooring that often is meant to be installed with a moisture resistant subfloor. Most laminates are made of wood fiber and thus look a lot like hardwood. These come in mostly affordable kits that tend to be tongue and groove, so they are easy to install. You can even line the seams with a bead of caulk like adhesive to match the flooring style for an added seal. With this in mind, if the seal breaks and laminate rooms are flooded, the moisture can be detrimental to the material and the flooring components can swell. In planning your bonus room, finished basement, or garage renovation it is paramount to first consider flooring and what might happen if you fail to protect against water damage. Water is a nuisance, and sitting water in these areas can bring on some pretty dangerous molds, which will ultimately render the room unusable and cost a pretty penny to fix. How much water does the space typically get? 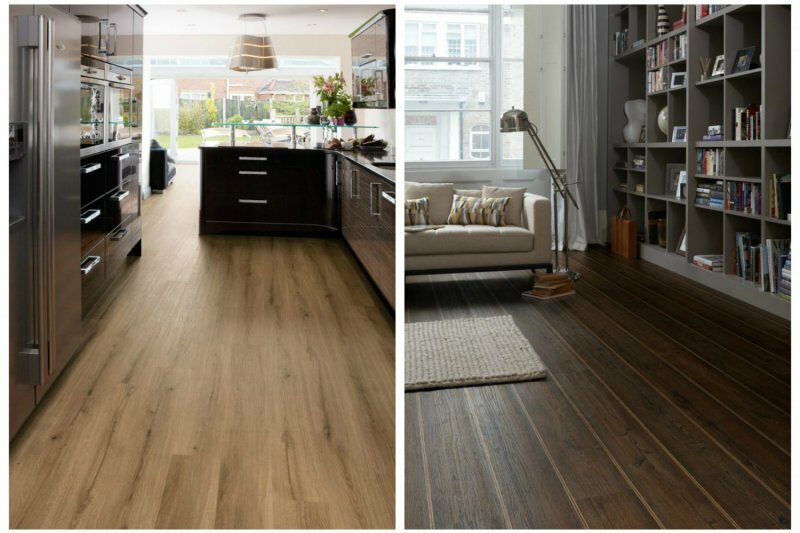 With these questions answered, you can begin to make informed decisions about flooring so that your new space is one that can be enjoyed for years to come.